Latri Nyima Dakpa Rinpoche teaches Sherab Cham Ma, or “Loving Mother.” This teaching was originally taught by Tonpa Shenrab, Founder of Bön and is part of the series of the Mother Tantra. 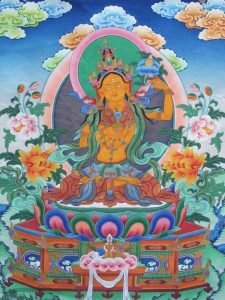 Sherab Chamma is the female form of the Enlightened One. She holds the collective power of Compassion and Wisdom of all enlightened ones of the past, present and future. She is also the source of manifestation of all the perfected enlightened ones. This course is an in-depth look at Daily Sherab Chamma practice. It uses the video of the retreat held in 2016 for the media. However, for those that are looking to deeply connect to this practice with extra information, suggested mind-training exercises, journaling prompts and more will find benefit in taking the course. Additionally, attending the course allows practitioners to connect with others who are practicing Sherab Chamma through the course forum. The course is split into two lessons meant to be worked over two months, but students will be able to work through the material at their own pace.